I drove over to the Lakes on the Friday afternoon and arrived at Denton House where we were all staying at around 7-30pm. We walked to Weatherspoon’s to have some food and met Bob who had left his car at Threlkeld and ran from there. He wasn’t staying the night as he had work at 6am the next day. It had been an absolute scorcher of a day and the forecast was good for the night, 16 degrees on the tops with little wind. 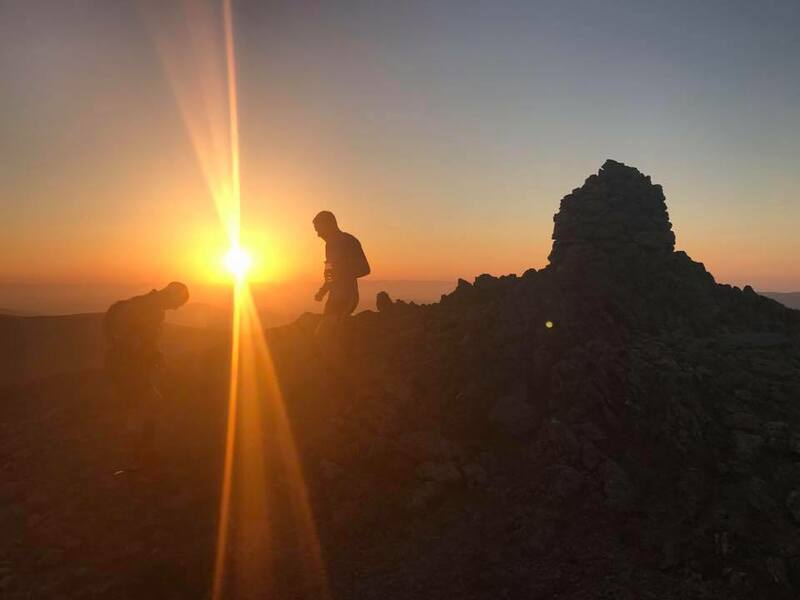 Also running on the first leg were Simon, Bob and Peter who set off around an hour earlier and was going to meet us at the top of Great Calva. I was glad that the forecast was good as the top of a mountain isn’t a good place to be hanging around if conditions are bad. I was leg leader for the first leg which meant it was my job to navigate and organise everyone else. It’s a massive responsibility – I would hate for Iain to not get round in time because of a mistake I had made and I was determined for everything to go smoothly. I did this leg last year on Paul’s round and we got round without any problems and to be honest Paul didn’t need any navigational help – he knew exactly where he was going. Although Iain is a good navigator himself he was very clear that on his round we wanted other people to have that responsibility so all he needed to do was concentrate on the running. 11pm finally arrived and we set off through the streets of Keswick and onto the first and biggest climb of the round to the summit of Skiddaw. We made steady progress with some good banter although it was very warm and I was sweating quite a bit. We reached the summit 2 minutes down on schedule and then the navigation came into play. We veered off the summit path and made a beeline for a fence which we needed to cross where there is a trod leading down over Hare Crag towards Calva. There is a style here and someone has tied a bright reflective band around the post which makes it very visible, although this type of this is against the ethos of the round as it is supposed to be a navigational challenge. We got onto the trod and I was very careful to stick to it. During the day in good visibility you can see it all the way down but there was no moon and very dark so all we could see was the few feet our headtorches were illuminating. The trod goes through some very boggy sections and if you go off course then the going is very heavy. Going down we could see Peter’s head torch at the top of Calva which I was pleased about as it meant he had got there safely. We reached the bottom of the trod and started the next climb up Calva. Iain mentioned that the pace was a bit quick. I’ve been on the fells many times with Iain and I knew that the pace we were going at was sustainable for him. We had stopped a few more times since Skiddaw too – just for a couple of minutes each time but those minutes add up so we had lost a little more time. I agreed to slow down but continued at the same pace and hoped he wouldn’t mention it again. He didn’t and we reached the top and met Peter. I took a bearing to find the trod that leads down to the river Caldew and we got onto it no problem. We forded the river no problem, I took another bearing and we started the long slog up Mungrisdale Common. Spirits were high and Simon kept everyone entertained with football related trivia questions. We found the quad bike tracks which lead up to the top of Atkinson Pike – one of the subsidiary tops of Blencathra and then cut across just before the summit to traverse over to the top where we passed a few people wild camping. We were about 10 minutes down but I wasn’t concerned as Iain was moving and eating well and he had an hour and a half contingency in his schedule. Peter had fallen back a little on the climb but made up ground so we all started the tricky descent down Halls fell together which I was pleased about. Conditions were dry and still and we made good progress down the ridge. We (myself, Iain, Bob and Simon) had came over the week before to reccie the ridge in the dark and that definitely paid benefits. I also had fun and games on the ridge with Peter the year before, on one occasion I fell around 20ft into a gully and on another Keith sliced his hand open on a rock requiring stitches so I was relieved when we all made it down safely and into the first changeover at Threlkeld. It was time to say goodbye to Peter, Simon, Bob and say hello to Jim who was running leg 2 (Chris was also supposed to be running but unfortunately had to pull out). We set off up Clough Head – one of the hardest climbs on the round in my opinion as it is incredibly steep and unrelenting. We reached the top in good time and it had started to get light – we could see the full ridge stretching out in front of us, a fantastic sight. We ticked off the Dodds and had a brief stop where Iain did what bears do in the woods. I have to say Jim did a fantastic job motivating and keeping Iain going on this leg. He had become very quiet and was complaining of feeling tired and a little nauseous. He was still moving well though – walking strongly on the ascents, running the descents and flats and he was eating and drinking. The sunrise over that section was absolutely amazing and a memory that will stay with me forever. We steadily ticked off the peaks on the ridge before reaching Dollywagon Pike and the steep descent down to Grisedale Tarn. Then followed the next big climb of the round and the last for me which is an out and back to Fairfield. Then a smaller climb up Seat Sandal and the descent down to the 2nd changeover at Dunmail Raise. We were 5 mins down now so had made up some time as at one point we were 15 mins down. Iain was very quiet and I knew that he was suffering, but Gillian, Steve and John did a fantastic job looking after him and making sure he had something substantial to eat. They also made me some pasta and a coffee which went down well as I had only had some maltloaf and a few chocolate bars since setting off from the Moot Hall. He then set off on leg 3 with Gemma and Keith and I went back to the hostel with Jim to try and get some sleep. There was a long wait before we heard any more news but when it came through it was good – Iain was strong coming into Wasdale and still well within the 24 hour schedule. I had decided to do leg 5 too so at around 4:30 we made our way up to Honister to eagerly await his arrival. Although the thunderstorm and torrential rain had now stopped it was still steadily raining and the clag had descended and shrouded the tops. After a few false starts we finally spotted the party coming down – Graeme blazing a trail in front followed by Iain, Fred, Paul, Tim and Jim. It was great to see him again and he was a different person to the Iain I had left at Dunmail Raise 12 hours ago. He was in good spirits, chatty and still moving well. We set off up the last big climb of the round, Dale Head – Chris, Adam, Peter and Simon all part of the company. We seemed to reach the top in no time and made steady progress over Hindscarth and Robinson where the clag began to lift and opened up the view down into Keswick – the final push. The last descent led us down to Little Town where Gillian, Steve and John were waiting with a change of shoes and luckily some insect repellent as the midges were starting to come out in force. The last 4.5 miles along the road were in great spirits, and Iain ran up to the Moot Hall, touching the door in 23:19. I felt quite emotional at this point, it’s been such a long journey for Iain and I’ve spent so much of it with him it was hugely satisfying for me to see him finally achieve his dream. Iain went back to the hostel to get some much needed rest and then everyone else headed off to the pub to mark the end of a fantastic weekend. It’s my turn next and I can’t wait – few things to sort out but essentially all of my hard training is done now too so it’s a case of tapering and winding down.